In the Netsparker Enterprise tab, you can enable signing in to Netsparker Enterprise On-Demand or Netsparker Enterprise On-Premises from Netsparker Standard. You can also enable the uploading of scans from Netsparker Standard to Netsparker Enterprise. You will need to have your Netsparker Enterprise information, including your User ID and API Token, and test the connection (see API Settings). For further information, see How to Sign in to Netsparker Enterprise from Netsparker Standard. Here is a table with a list of the Netsparker Enterprise Settings and Information. This disables the ability of Netsparker Standard to sign in to Netsparker Enterprise. This enables Netsparker Standard to sign into Netsparker Enterprise On-Demand. 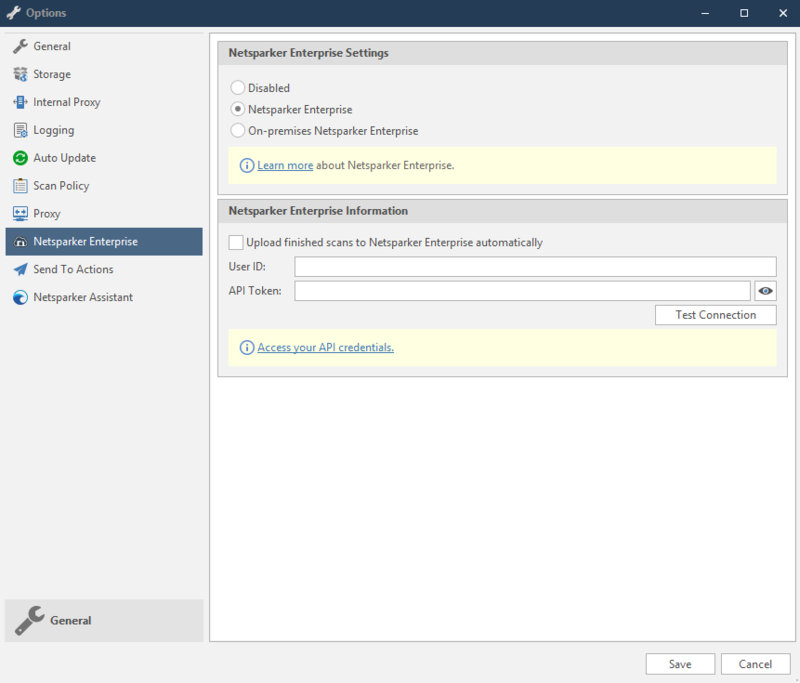 This enables Netsparker Standard to sign in to Netsparker Enterprise On-Premises. This enables finished scans in Netsparker Standard to upload automatically to Netsparker Enterprise. This is your Netsparker User ID (see API Settings). This is your Netsparker API Token (see API Settings). This enables you to test the connection between Netsparker Standard and Netsparker Enterprise. Click the Netsparker Enterprise tab. In Netsparker Enterprise Settings, enable Netsparker Enterprise. The Netsparker Enterprise Information section is displayed. Alternatively, enable On-premises Netsparker Enterprise. Enable either Netsparker Enterprise or On-Premises Netsparker Enterprise. The Netsparker Enterprise Information section is displayed. In the Netsparker Enterprise Information section, enable the Upload finished Scans to Netsparker Enterprise automatically. Complete the User ID and API Token, if not already entered (see API Settings).